Shifters Unbound!!! Yes!!! Yes!!! Yes!!! Ok.. we all know I love love love me some Shifters Unbound! This has to be one of the best paranormal romances out there... Right up there with the Nightwalker Series. This is Spike's story... Remember Spike from book 1? He was Fergus' tracker, then after Liam killed Fergus, Liam took in Spike's family and made Spike his tracker. Spike pops up in all the books some way or another, but this was great to get a look into Spikes world. Narration was just amazing. Perfect! This is a buy or credit. You won't be disappointed. If you don't have this series... then get it and enjoy! 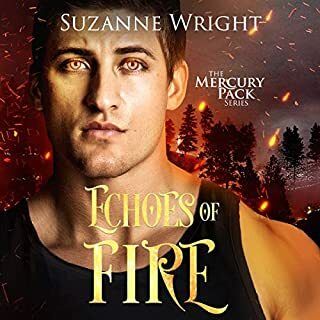 You may say "outch" at the price for a 4h 30m listen but if you're a fan of the Shifters Unbound series please don't be put off as JA packs a hell of a lot into this short listen. It's filled with drama, tension, fun, sexual chemistry, romance, heat and it's an emotional ride for Spike as we, the silent onlookers, bear witness to the many events that he has to deal with - joy at finding out he's a Father, tenderness as he learns to cope with an unruly 4 yr old cub, sadness at the loss of the cub's Mother, turmoil at claiming a mate that's not sure about her feelings, anger at events that unfolds (I'm not giving anything away) and eventually happiness as he finally finds love (oh all right I just did give a bit away - but you know how they always end anyway and we all want the HEA ending don't we). Worth a credit? I didn't hesitate as I love the series and anything JA writes - so that's a YES from me. Narrator Can't Do an Accent!! Jennifer Ashley's shifter stories are great. I read the first 10 books years ago, and was excited to find them on Audible. I really enjoyed the first book, and I thought the narrator was fantastic. I just wish she hadn't changed narrator's after the first book, "Pride Mates." Cris Dukehart's Irish accents make me cringe, and now she's decimated the Latin accent. Why this woman was allowed to narrate another dozen books is beyond me. especially since so many listeners have complained about her narration. Was Jennifer Ashley just not listening, or did she just not care? Maybe she didn't have any control over who the Publishers chose, but listening to this cartoon is Lucky Charms Irish accent every time she others align truly makes me nuts. This one really pulled on your heart strings. Such intriguing characters along with a terrific story. Such an amazing ending for two lonely people. You could almost see the little jaguar cub, the descriptions were so vivid. The love making scenes were very hot & fairly explicit, just perfect. Don’t miss out on this story. I wasn’t sure I like her version of shifters when I listened to the first two books, but I’m hooked now. Great narration by Cris Dukehart. a great story of a dad stepping up, changing a girls view and being a shifter. 4/5 rating: good pace; lots of action; interesting characters and story. Talk about a walk on the wild side. This story had a little bit of this and that with another side of what the actual crap? I loved it and let’s just say the cub (Jordan) is awesome and hysterical. I love hay kid. He’s a mean little jaguar. But he gets it naturally. loved the story, the characters and the continuation of the plot. had just enough action to keep it exciting. Oh man, what a great little novella in the series. Especially after the disappointment that was Book #3. Spike is a tracker for the Austin Shiftertown. He's also one of the best fighters in the ring. But his life changes when he discovers that he has a cub. And what an adorable little ball of fur Jordan is! Suddenly, being a father to his cub is the most important thing in his life. Myka was the best friend of the cubs deceased mother. She's looked after him for 4 years and loves him. Bring together the 2 people who love Jordan the most and watch the sparks fly. I loved the book, so nice to hear the words that made me sit on the edge of my seat .